Its given name was the “Fort Armstrong Theatre” and it was called the “Castle That Shadows Built.” The shadows, of course, referred to the silent movies that were shown there. Later it was named simply “The Fort.” Now it is “Circa 21,” named for 1921, the year the theatre first opened, and it is the home of live musical theatre, concerts and special performances – with dinner too. It is one of Rock Island’s most unusual and special buildings – so special that it deserves two different postcards. 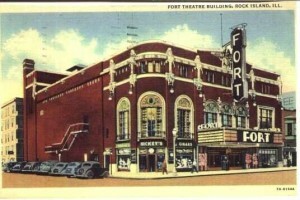 Although the first postcard wasn’t published until the early 1980s, it reproduces the architectural drawing of the Fort Armstrong Theatre around the time it first opened. The second postcard dates from 1937, and shows the huge new marquee and vertical sign that had just been installed. The Fort Armstrong Theatre was built during the grand years of movie palaces, an era when big theatres across the country were designed with a theme. Usually centering on an exotic place – a Renaissance palace, a Spanish courtyard, an Arabian garden – the theme was also reflected in the theatre name – Granada, Rialto, Alhambra, Coronado, to name but a few. In a bold move away from such fantasy and fakery, the theme of the Fort Armstrong Theatre was much closer to home – our Illinois Indian and prairie heritage. Built on the site of a massive old YMCA Building that has it’s own postcard story, the theatre was the dream of Walter Rosenfield, a prominent businessman who would soon become mayor of Rock Island. Mr. Rosenfield formed a company to build a theatre, then traveled to Chicago to hire the Braun and Ermling architectural firm as designers. It has been reported that the concept for an Indian and prairie theme was Mr. Rosenfield’s idea, but who actually did the majority of the design work? Several have claimed credit, and perhaps the credit must be shared. We know that the local architectural firm of Cervin and Horn was actively involved during the construction. Benjamin Horn, a 1918 University of Illinois graduate had recently joined Olof Cervin, who had been a practicing architect for twenty years. Mr. Horn claimed credit for conceiving the idea of using pioneer days as a design theme. We also know that Braun and Ermling employed a young draftsman, Rudolph C. Sandberg, whom they sent to Rock Island to supervise construction. Mr. Sandberg, who soon moved his family to Rock Island and became an architect, is generally accepted as the actual designer of all of the terra cotta (glazed ceramic) ornament on the exterior of the building and possibly some the decorative plasterwork on the interior as well. Mr. Sandberg visited local collections of authentic Indian artifacts to sketch them for inspiration. In later years as an architect, he designed the Illinois Oil Products Building on 24th Street and 4th Avenue, which also has a great deal of glazed ceramic trim. And, finally, William H. Lautz, an instructor of architecture at the Chicago Art Institute, worked on the proscenium – the tall arch above the stage – which depicts plaster relief details of Indian life and pioneer days. The theatre, which seated 1800 (700 in the balcony) was constructed by Moline contractor Brissman & Company. For its grand opening on January 19, 1921, The Rock Island Argus published a special supplement describing the theatre, its construction, and its entertainment programs in great detail. It was designed to be a “happy” theatre, not “sombre, gaudy or cheap.” Molded decorations and bright color were everywhere, inside and out, and each detail reinforced the Indian and prairie theme. Occasionally the Indian imagery had a source other than the prairie — notably the huge genuine Navaho blanket, which reportedly served as a stage curtain. Six custom-designed chandeliers hung from the ceiling. They were made of imitation sheepskin – parchment – and looked like an inverted umbrella or teepee, with ribs formed from arrows, and real feathers dangling downward. The stage backdrop was reported to be a detailed painting of Rock Island as viewed from the river. On opening night a ten-piece orchestra played from the orchestra pit, then several silent movies were shown, with the new pipe organ providing background music. Theatre patrons could have a snack at the corner cigar store and soda fountain operated by Hickey Brothers or go to Hickey’s upstairs tearoom that was accessible both directly from the theatre as well as from the cigar shop. In later years, the Garden Shop occupied the old Hickey Brothers shop. Musical and film programs continued for several years. But by 1929 the theatre announced it would abandon stage shows and “movies” to specialize in “talking pictures.” The talkies were successful for decades, so successful that that two movie premiers were held here, in 1945 and 1951. However by the 1960s suburban movie complexes drew patronage from downtown theatres. The Fort fell on hard times, showing second run and childrens’ movies, and then was closed. After it had been vacant for several months in 1972, rumors arose of its impending demolition. The rumor was quelled by the strong denial of Rosenfield heirs, who still owned the building. The theatre was again rented and reopened, but less than a year later, the film management company began to show adult films. The future indeed looked bleak and it looked like even Walter Rosenfield’s children wouldn’t be able to save the theatre. Dennis Hitchcock, described at the time as a “young dark haired man from Minnesota” and his Dinner Theatre Associates, Ltd. arrived on the scene just in the nick of time. His company purchased the building from the Rosenfield heirs in 1976, then undertook renovation and remodeling to adapt the interior for dining as well as theatre. Finally, it was renamed Circa 21 to honor its original 1921 opening. And on June 10, 1977, the theatre gloriously reopened as a dinner playhouse, featuring “I Do, I Do” as its first offering. Soon thereafter, the theatre was listed on the National Register of Historic Places. Mr. Hitchcock printed the featured postcard with the historic architectural drawing (the original drawing hangs in the theatre), which shows a very simple marquee suspended by chains. However it may not accurately represent that first marquee, as a photo published in 1922 shows fancy panels, with movable lettering, rising above each end of the simple marquee. In addition, a tall vertical sign was suspended above the second story windows. This was probably the “display sign” which, according to the special Argus supplement, was “custom designed to ensure harmony with the rest of the building.” It contained illuminated letters and a border of lights around the edge with a cluster of lights at the top to light the feathers of an Indian headdress. The word “Fort” appeared in small letters below the headdress, while “Armstrong” in larger letters ran vertically. This sign, too, is visible on the 1922 photo. 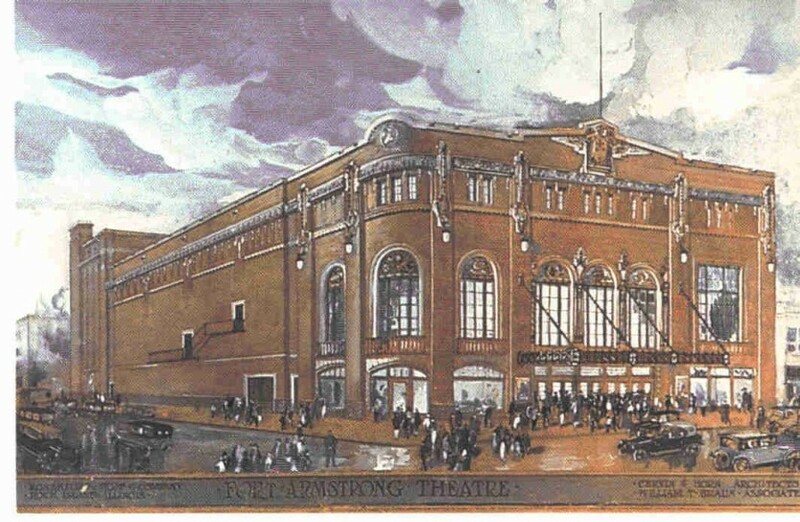 In the mid 1930s, there was a major renovation that included new seats and “modernization from box office to stage.” That is when the big marquee and vertical sign shown on the second postcard were installed. Notice that the name was shortened to just “Fort,” probably to avoid confusion with the nearby Fort Armstrong hotel, which had been built in the mid 1920s. The large brightly-lit marquee and sign, although typical of the era, overwhelmed the theatre’s intricate exterior details. Again Dennis Hitchcock to the rescue. Soon after opening Circa 21, the massive 1930s marquee and sign were removed, leaving a simple framework, reminiscent of that on the drawing, with a simple canvas covering. More recently, in honor of Circa 21’s 25th year, the marquee was recreated with an appearance very close to the 1922 photo, although without the vertical sign. At the same time, a tremendous amount of restoration occurred on the inside of the theatre. The images around the stage have been carefully colored and now leap out from their formerly monochromatic background. This detailed paintwork has brought out previously unseen details, like the pair of owls near the stage. Other areas have been renovated as well and even new draperies have been custom tailored to reflect the original designs. There’s so much more to tell you, but look for yourself. It’s worth a trip to the library to view the Argus archives. Then stroll down the street a block to see the new Circa 21 marquee. Finally plan to take in a dinner theatre performance. You’ll see a talented performance in a wonderful atmosphere and – and eat well, too. During the holiday season, Circa 21 presents matinee productions for the younger crowd. Plan a holiday trip with the kids or grandkid to the matinee, then have a “scavenger hunt” to see who can identify the most artifacts in the theatre details. As noted above, Circa 21 was named for the year 1921. With all the recent restoration, the name becomes even more appropriate as this marvelous theatre graces Rock Island in the 21st Century.